This was my second experience with a Taylor Jenkins Reid novel, and just like the first, I really appreciated this unique storyline that causes the reader to stop and think -- to question the character's choices, and their decisions. I've come to realize that reading one of her novels will give me much more than just a story to be lost in, it will provide a reading experience that will stay with me long after I've turned the last page. Emma thought she had her whole adventurous life ahead of her, along side her partner Jesse. The two of them would travel the world together, live in the moment, and settle down later when the time was right. What she didn't foresee was Jesse being lost at sea and the aftermath destroying every cell in her body. The moments as Emma stumbles numbly through the grief and loss of her husband were achingly real. I felt the pain Emma felt, I could hear her sorrows through the written words. Just when she thought she couldn't come back from this, she somehow finds her way home.. to her family, to a life she was so insistent on leaving all those years ago with Jesse. And in return, as she heals, she discovers a new part of herself, also discovering a new love in a long ago friend named Sam. It was these moments in the story when I felt as though Emma's true character really shined. Sure she was having the time of her life seeing the world with Jesse, but at the end of the day, being home with her family and making a new life with Sam was where I truly felt she belonged. So when the phone call came that Jesse was alive, it not only threw Emma for a loop, but it also had my literary heart torn in half. How does one choose? Or do they even choose? I honestly could not imagine being in Emma's shoes in that moment. I felt that her actions were honest, though sometimes a bit vulnerable and definitely a bit messy, they were REAL. She didn't choose to break away from Jesse, her husband, he was stolen -- ripped right out of her life. And she never considered having to start all over again by finding a new life, a new Emma, with Sam. I knew the decisions she had to make were not going to be easy, and her path in getting there was going to be constant with road blocks and detours. This novel is so much more than just a love story, it's words about rediscovering who you are as a person, without your other half. It's how to put one foot in front of the other when your legs seem to stop working. It's about making choices that aren't necessarily easy, but definitely right. I applaud this author for pushing the limits and creating a storyline that causes the reader to stop and think, to question "what would I do in this situation?". That is the true beauty of literature -- taking a story and making it your own. Lovely review, Ginger! And I absolutely agree. 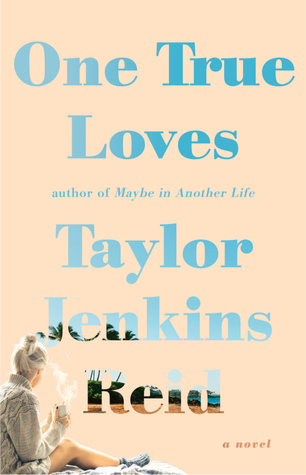 What I find wonderful about Taylor Jenkins Reid's novels is that she ALWAYS manages to make me think about the themes she weaves into her stories - and One True Loves was no exception.